Spirits of trees that are hundreds of years old, which are believed to be rainmakers, guardian protectors with healing powers in their leaves and flowers. 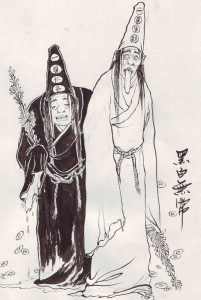 The leader among plant spirits, the Shu Jing enjoy tributes of food and drink. Old trees are very much venerated in China, it is said that if they are cut, they would bleed. The Shu Jing should not be confused with Pu Songling’s tree demons, depicted famously in Cheng Xiaodong’s film “Chinese Ghost Story” (1987). Their name literally means “boat apparitions”. These are souls of the drowned, said to be active at a beach in Hainan called the Weeping Ghost. Seen by those out at sea from their boats, they appear on the crest of waves and are believed to portent danger and disaster. Otherwise, they are mostly harmless. People out sailing who see them usually feed them rice, turn their ships and head back to shore, grateful for the warning. Artwork by He Xin. 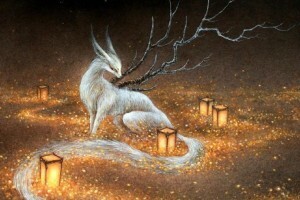 Believed to be spirits of deceased foxes that lie unburied. They like to reside in plates, bowls and other domestic objects. These are friendly ghosts, and not to be confused to fox demons. The benign spirits of animals such as weasels, foxes and raccoons (sometimes referred to as Wu Xian, the Five Spirits), were venerated in many places around China. Hu Xian has been the subject of many great stories in Chinese literature, such as the Jin Dynasty (265-420 CE) collection of supernatural phenomenon by Sou Shen Ji and Pu Songling’s 18th “Liao Zhao”. 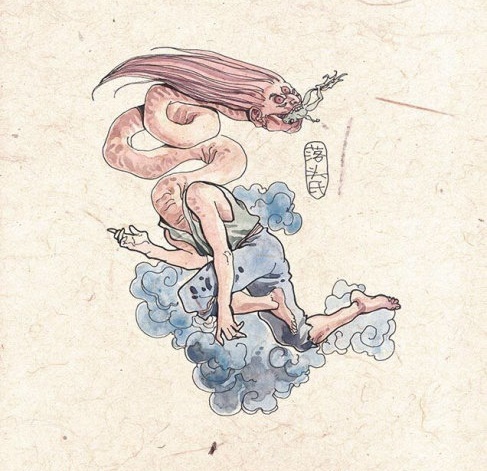 These are beings whose heads can detach themselves from their bodies, fly out and wander around while they are asleep, flapping the ears like wings on their wanderings. It’s vital not to cover the neck or the head would be unable to re-attach itself upon return, causing both head and body to perish. 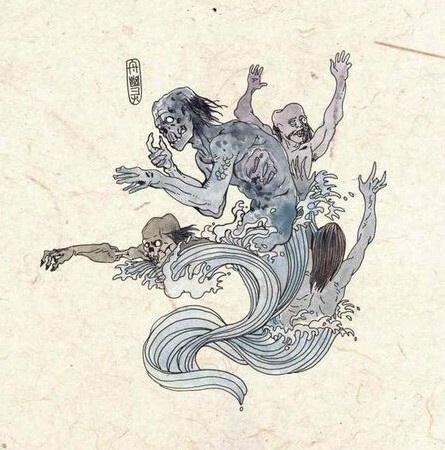 According to texts of the Jin era, these beings were a race that lived in the southern lands, where some insects also shared similar head-detaching abilities. The far south of China, known as the Ling Nan regions (Guangdong and Guangxi) was only accessible when Tang Dynasty (618-907 CE) roads were built through hitherto impenetrable Nan Mountains. Hence China’s historical fascination with the exoticism of the far south. 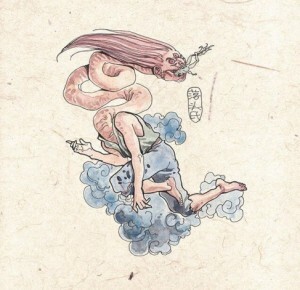 The Chinese tiger god is a friendly and whimsical being, who sometimes appears in human form, other times in a human body with a tiger’s head. Hu Shen likes to tap people on the shoulders from the back and converse with them. Friendly yet powerful, Hu Shen can command tigers. If you’re lost in the woods and run into this being, you’re in luck. He likes to guide lost travellers through woods and forests. These ghouls were believed to be the ghosts of a pair of friends who were in death as they were in life. They were given the task of hunting stray souls by Yan Wang, king of the underworld. There has been, and still is, much love for this pair of ghoulish helpers in Chinese pop culture. If you’d like to read more about them, see the link to my other article at the end of this mini series. Tailess Black Li is a black dragon without a tail, banisher of floods, venerated in north-easternmost China. Legend says this black dragon was born into a family with the name of Li. When he turned into a dragon, many feared he as a monster. They cut off his tail. But Li Hei still loved his homeland very much. When the white dragon brought on the floods, he subdued them. The villagers severely regretted how they had treated Li Hei, so they named their province Hei Long Jiang (Black Dragon River). The Bai minority in Yunnan have a similar myth that involves a dragon pearl and a little yellow dragon. Fierce protector gods who devour ghosts and demons. They come in multitudes, some live in the human world, others in the heavens. Due to their demon-like appearance, they have often been seen as such in pop culture, vampiric, women-snatching, haunters of the wilderness. The female Ye Cha are generally much better looking. There are depictions of friendly Ye Cha, such Pu Songling’s account in Liaozhai. These creatures are popular with tattooists.